Kelsey Allmon speaks at the December 2018 commencement ceremony. Mark Cornelison | UK Photo. 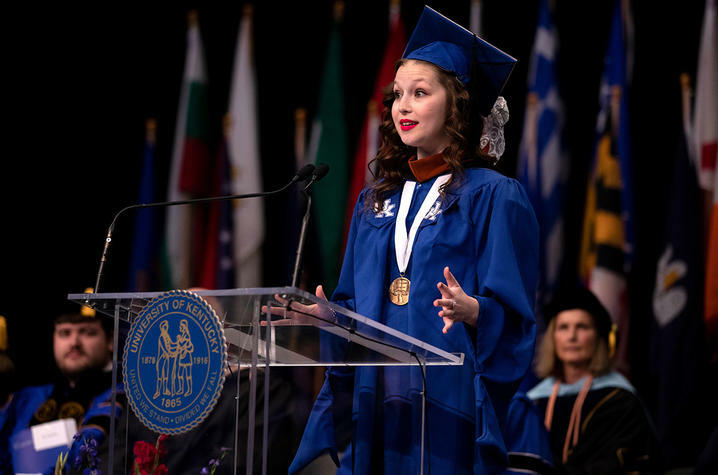 LEXINGTON, Ky. (March 11, 2019) — In line with university tradition, four outstanding students will have the opportunity to deliver a three-to-five minute commencement address at one of the University of Kentucky Commencement ceremonies this May. Applications for student speaker will be accepted through March 26. The selection committee will review applications from students with all degree types, not just undergraduate students as has been done in the past. Students interested in applying must be receiving a degree from UK at one of the May Commencement ceremonies. Applicants must have contributed to the university through campus and community activities or through their chosen field of study and demonstrate public speaking ability. Applicants must be willing to present their address to the Commencement Speaker Selection Committee and be available for a possible short interview and speech demonstration. Documents are required to be submitted in PDF format with the applicant's first and last name. Applications are available online at www.uky.edu/commencement/speaker. To better accommodate UK graduates and their families and friends, UK now holds four ceremonies for May graduates. The ceremonies will be held at Rupp Arena.